I saw a chef on television make a mushroom dish called “ragu”. 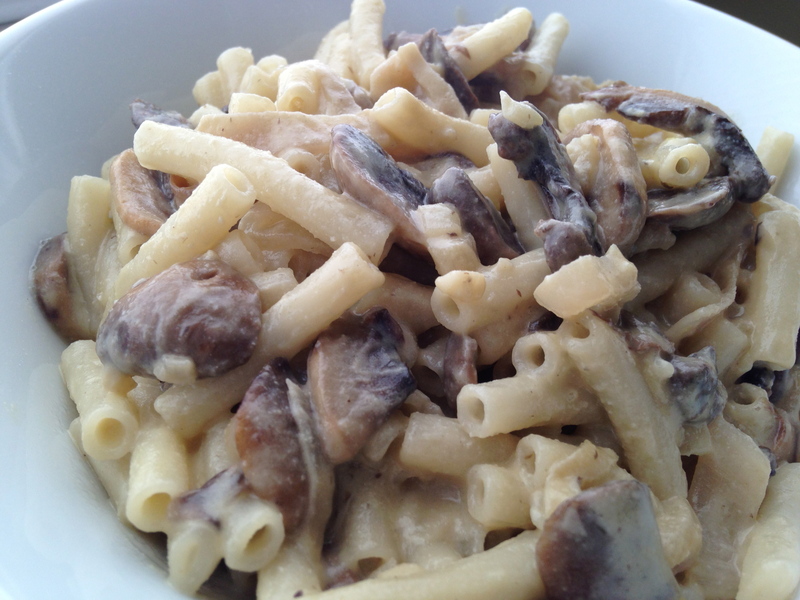 I never heard of ragu but I love mushrooms so I made up my own and just devoured it for lunch. I used macaroni pasta because that is what I had in my house but you can use any shape, really, it’s pasta! Dice the shallots and mince the garlic. Place into a pan with olive oil on medium to low heat. Let the shallots and garlic start to soften. Slice the mushrooms. After a few minutes, add the mushrooms to the pan and let them brown. Then add the white wine and cook down for a minute (to cook out the alcohol) and then add the cashew cream. Cook for another minute until the sauce thickens. Season with salt. Soak cashews overnight and then drain the water. Add to the Vitamix or blender with enough water to cover the cashews. Let it go until the cashews become creamy. Add more water, if necessary. Use the cashew cream plain for this recipe or add few shakes of nutritional yeast. The rest can be made sweet with agave and vanilla for a dessert topping or savory with lemon juice for sour cream.